November is upon us. Many persons I know dread this month, as it is the month of remembrance of the dead, the month of grey, foggy, cold dull days. There is lots of work in the garden to prepare it for winter. With the change of the clock to winter time this past weekend it is practically dark by 5pm. It is also the transition month between the last warm days of the year with the explosive colors of autumn and the happiness and joy of the upcoming festive season. Even though daytime photography is practically limited to the weekend as daylight is limited to my working hours, November has great photo opportunities on its own. The fog that frequently enters the city and creeps along the banks of the Pegnitz river makes for great images when combined with the rays of the street lanterns and silhouettes of people rushing by. And its the best time to go out and do some night photography, something we now can comfortably do directly after work, without having to wait until 11pm like in the summer months. 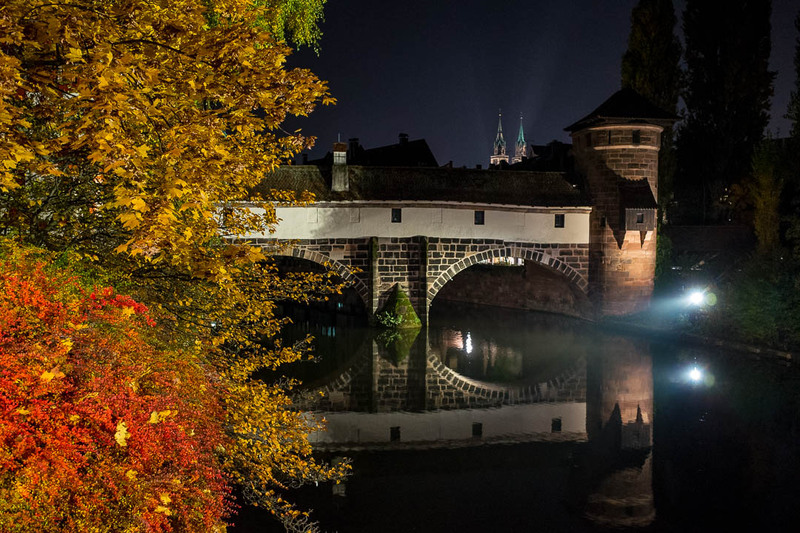 Nuremberg provides for some awesome night photography opportunities, as you can see from the example above. I took this image from the Maxbrücke towards the Henkerhaus (hangman’s house) with its double arches crossing the Pegnitz River. Visible in the background are the twin bell towers of St. Lorenz Church. I took this image with the Ricoh GR II. Specs are 1/4 sec at f/2.8 and ISO 1600. I rested the camera on the stone railing of the Maxbrücke and used the self timer to avoid shake. I always find it amazing what this small cam is capable of producing in terms of IQ. Have a great November ! Nice, the water looks mirror-still. Absolutely stunning and I love the mixture of the night with the yet vibrant fall colors. I immediately got homesick seeing your picture and I love the old world feel, the cobble stoned roads and, well just the feel of home. I love the variety in your pictures and like me it looks like that you don’t limit yourself to only one subject matter which keeps it interesting and open to explore a roam of diversity. Great job ❤️ and love your beautiful home. That is certainly an interesting photo. I grew up in the tropics, so still struggle with the short days in Europe. This is a nice motivation to get out more in November.